It's official... I have a new least favorite movement. The Hamilton 629. I've never worked on a 629 until now. So I took extra photos to show you how it comes apart. The 629 is a 17 jewel micro-rotor movement with a date complication. It was used in Thin-o-matic models as part of the Dateline series. 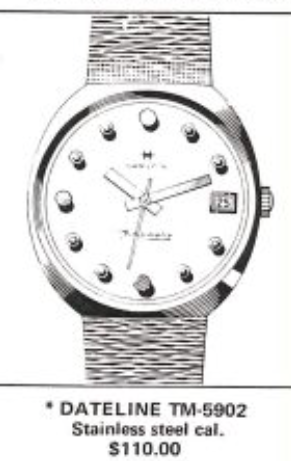 One of the models is the 1971 Dateline TM-5902. It was made for two years. The TM-5902 came in a stainless steel case. It clearly has 1970's styling with funky round hour markers and fat ol' hands. It came with an integrated bracelet with lugs that were hidden by the bracelet and the snap-on bezel. My project watch came courtesy of a fellow collector who found it at a jewelry story as left over inventory. So it looks like it's brand new. The bezel pops off with a case knife to reveal what looks like an ordinary round watch. Now I can grab the crystal and open the watch. "The claw" makes short work of opening the watch. The next trick is to get the movement to separate from the two-piece stem. The 629 movement looks to be in excellent condition - which you would expect from a showroom "case queen" that has never been used. The dial foot screws are set at an angle on the sides. Two screws hold the dial on. Look how tall the hour markers are. The dial-side of the main plate has instructions for assembling the front. I'm not sure what step 1 is supposed to be though. Step two is to add the hour wheel and step three is to slide the keeper down to hold the hour wheel in place. Two screws hold the cover in place. Once they are removed I can gently pry the cover up and out of the way. This is interesting... I removed the canon pinion from the center. It's actually not driven by the center wheel. It's driven by the minute wheel to the right of center and the center wheel is under the set bridge. This style movement has a friction set wheel on the center wheel post. So it is driven by the center wheel when the watch runs but it can be overcome when setting the time without jarring the gear train. The back of the cover has a spring to hold the indexing arm against the date wheel. Now I'll start to remove the wheels that drive the calendar complication. The largest wheel and smallest wheels are lifted off but the golden wheel in the middle has a screw holding it down. Now to remove the wheels under the set bridge on the right. The white colored gear is the center wheel and it actually comes out the back. The other gears can be lifted out now. With all the parts removed from the front, I can turn my attention to the back of the movement. First I'll take the balance off. Then I'll pull the pallet fork. That will allow the gear train to unwind fully. Two screws hold the oscillating weight in place. I'll remove that to keep it from flopping around. Next, I'll remove the large ratchet wheel and get ready to pull the barrel bridge. With the barrel bridge and train bridge removed you can see the power train. The second wheel drives the third wheel as well as a seconds pinion under it's own bridge in the center. The gear train for the automatic winding complication can be removed now. There's one arbor-less gear under the rose-colored jewel. I'll slide that out once the other wheels are removed. Everything is cleaned and dried. So far I haven't lost any parts either - which is good, since I don't have a spare movement to steal from. For reassembly, the first things I'll install are the setting parts. That way I can use the set bridge to secure the center wheel when I install it from the other side. Now I'll install the train wheels and the seconds pinion. When I went to install the barrel bridge, I noticed the click spring was missing. I eventually found it on my workbench. Finally, the movement is ready to wind and reinstall the balance. First the balance jewels have to be reinstalled under their Kif-style shock springs. The watch is running without it's other balance jewel. That's a good sign. I'll install the jewel and put the movement on the timer. Interesting... this movement has a 19800 beats per hour beat rate. That's 5.5 beats per second, a little faster than the typical pre-1969 movement. With a little tweaking I get the beat error to come in line. And a little more tweaking gets the beat rate to level off too. Not too shabby. I'll install the original bracelet that my friend included with his watch. Voila! You'd be hard-pressed to find a nicer looking TM-5902, I bet. After a few minutes I realized the minute hand wasn't moving. The second hand was fine but the other hands didn't move. That meant the collar on the center wheel needed to be tightened. So I had to take it apart again and use my staking set to tighten the friction-fit collar on the center wheel. That's not fun - especially if you don't have a spare. However, I was successful eventually and now the watch runs as nice as it looks. I don't care much for the 629. It took me the better part of three hours to complete this project. There are a lot of obscure parts to the movement so having a donor movement on hand would be helpful. There are several springs to be careful of and the date complication is a little wonky. The large golden wheel that drives the date complication makes a complete revolution every four hours. Each time it spins it gets a little closer to moving the date wheel. At 8:00PM it almost changes the date and the date wheel flutters but doesn't change. When it reaches 12:00 AM it changes the date and then the wheel goes back to it's 4 hour cycle. The caliber 629 in my Thinomatic gave my watchmaker nightmares. On the quest to find a spare one just for parts. Thanks for the great write up.